Enjoy the beauty off the nature of Rhineland-Palatinate in Germany. The Rhineland-Palatinate in south-western Germany has a unique identity based on vineyards, picturesque landscapes and castles. The region has a lot to offer a camping holiday. From a LuxCamp mobile home, you experience the richness of the culture while retaining the comforts of home. The fertile river valleys in the area are ideal for Germany’s famous wines. Overlooked by a fortress, picturesque villages have grown up around terraced vineyards. 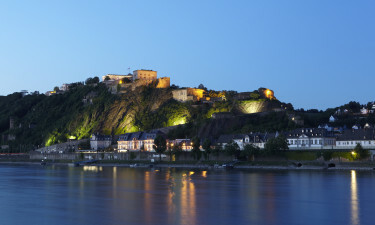 Try a cruise along the Middle Rhine to view the castles. Holiday memories are made at a luxury camping site in the Rhineland-Palatinate. Why choose a camping holiday in the Rhineland-Palatinate? Mainz is the largest city in the area. In addition to historical architecture, the city has a museum dedicated to Gutenberg, creator of the printing press. Speyer has a preserved medieval core and 12th Century subterranean baths and its grand Romanesque cathedral contains the tombs of emperors, kings and empresses. Worms is on the Upper Rhine and boasts an enviable Romanesque architectural history. Tourists by the thousands flood into the city for Backfischfest, an annual wine festival that allows visitors to sample the regional wines, and you should be sure to see the Vintner’s Fountain.